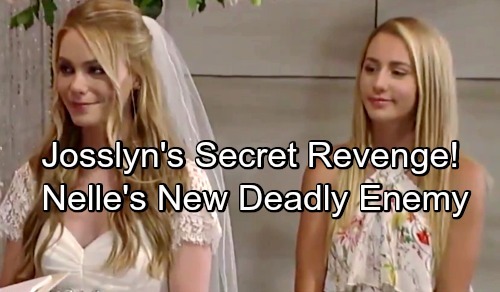 General Hospital (GH) spoilers tease that Josslyn (Eden McCoy) could be taking a cue from her sneaky brother. GH viewers were thrilled when Michael (Chad Duell) suddenly got smart and started plotting Nelle’s (Chloe Lanier) takedown. He’s fed up with all the lies and manipulation, so his “baby mama” must go! Of course, Josslyn was a different story – at least at first. She took Nelle’s side right after her staircase tumble and refused to visit Carly while she had the chance. Josslyn was undoubtedly overwhelmed, especially after seeing Nelle helpless on the floor. Her testimony even helped Margaux (Elizabeth Hendrickson) put Carly away. However, it seems Joss is changing her tune. In fact, she may have secretly switched sides already! Just before the wedding kicked off, Ava (Maura West) smelled a very familiar scent on Oscar (Garren Stitt). She asked him about his cologne and got confirmation that it was the same brand Morgan (Bryan Craig) used. When Ava found out that it was Josslyn’s gift, she was understandably confused. Ava wondered why Joss would give Oscar the same kind her deceased brother liked. She seemed sure that Josslyn would’ve known Morgan’s scent. Many GH fans have also had questions since Joss stole that cologne. For starters, that’s a heavy bottle. Despite Josslyn’s claims, it’s not something you just shuffle into your bag by mistake. Joss had a quizzical look as she smelled the cologne later. Did she recognize it? That’s certainly an option to consider. A half-empty bottle of cologne is a weird present, so maybe Joss had some sort of plan in mind. It’s possible she wanted to rattle Nelle and even Ava. Like Michael, Joss may be hoping that Nelle slips up somehow. Then again, perhaps Joss thought it’d come in handy as evidence. She might’ve figured it’d be safer in Oscar’s hands. Josslyn was awfully cold to Oscar when he approached her at the wedding. That cologne could be giving her bad vibes. GH most likely wants to show Joss and Oscar growing apart to create a love triangle with Cameron (Cade McWatt), but the cologne could still be a factor. It might be bringing back memories of Morgan and killing the mood. Josslyn also caught Nelle and Chase (Josh Swickard) sharing a passionate kiss. Once Nelle realized they were being watched, she shoved Chase away and claimed she was his obsession. Joss took Nelle’s side, but was it just for show? When Nelle and Josslyn hugged, Joss didn’t look convinced of her supposed pal’s innocence. General Hospital spoilers say Josslyn will spill the kiss news to Michael, so it’s clear that she’s not exactly loyal to her friend. Joss’ family comes first, so maybe she’s doing a little scheming as well. If she’s not now, she definitely will be soon! Michael’s “death” should rock Josslyn like never before. She’ll be on a mission for vengeance, so she should make Carly proud. Are you anxious to see what Josslyn has in store? We’ll give you updates as other General Hospital details emerge. Stay tuned to ABC’s GH and don’t forget to check CDL often for the latest General Hospital spoilers, updates and news.